1 word: Wow. 50 states, under 4 hours, before age 40. It was a dream I came up with oh so many years ago, after I ran 3 marathons that happened to all be in different states. As soon as I hit 10 states in Nevada (12/2007) I got into the 50 states club (obviously not a finisher) and then proceeded to start the long and expensive slog towards my goal. 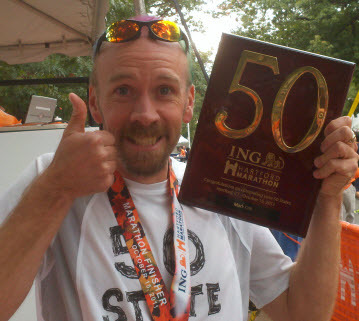 Doing all 50 states before I turned 40 years old (8.18.2012) gave me motivation to train hard and race often. My job and schedule allowed me to do it without going into too much debt. 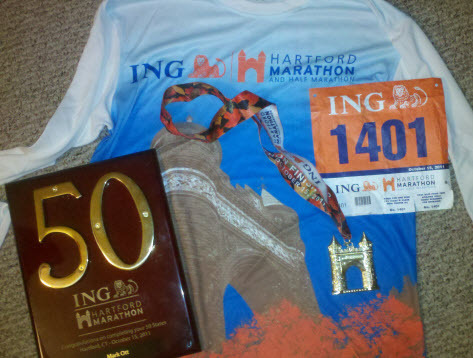 The logistics were almost fun to do, sometime knowing the next 9 marathons I was running. Doing 5 doubles (marathons in consecutive days) saved me some money I knew October 15, 2011 was going to be the end since sometime during the summer of 2010 when I mapped out the final 15 marathons needed. 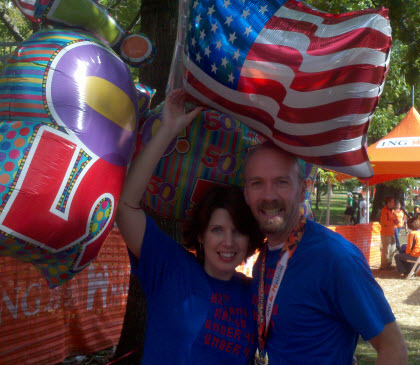 For a last-marathon-for-this-life-goal marathon, it was a nice microcosm of the whole journey. I got to make this long road trip with my lovely wife, Misty. When I met her two and half years ago, I was halfway done with my states, and she knew that A) this was an important goal for me and B) running was what made me happy, kept me sane and even keeled. She knew I was not wealthy and that it was costing me quite a bit to do this, but she ever said anything to discourage me. She supported me completely through until the very end, taking time off to drive 12+ hours to Connecticut. We left soon after Misty got out of work Thursday afternoon and got about 4 hours down the road and stayed in a cheap hotel in eastern Ohio. I am used to staying at crappy hotels for these trips( saves money) but with Misty there, it made it all ok. We woke up early Friday morning and drove the last 8 hours through PA and NY, making it to CT in the late afternoon. The fall colors in central PA are very beautiful. Rolling hills, a zillion different colors on the leaves, it was awesome. I dropped Misty off at the hotel so she could do a workout quick while I went to the race expo. Predictable expo for a race this size, with maybe 50-60 vendors hawking their wares to the marathoners. As usual, I bought nothing as there was nothing there I needed or much wanted. Some of the official race gear was cool, but I don’t need any more shirts/hats/jackets than I already have. The official race shirt was totally awesome, so that was cool. I went back and picked up Misty and we headed 10 miles away to (you guessed it) Applebee’s. I have to go back into the record and count how many times I have eaten at an Applebees the night before a race and also notice how well I do the next day. I think there is a very strong correlation between the two. The night before career marathon 71 I slept surprisingly well, waking up for the first time at 4 am, which is a little later than usual. After waking up refreshed, Misty and I arrived at finish for a Marathon Maniacs group picture about 45 min prior to race start. I had made a custom shirt just for today which read ’50 state finisher TODAY 10-15-11’ and I got lots of comments from people before and during the race. This being a large race (14,000+ full and half marathoners) they had the elite section way up front, then a second corral for qualified people who proved they can run under a certain time (3:20? I don’t quite remember) then there was the rest of the pack. I submitted my paperwork to be in the second corral, even though I didn’t think I might run up there. I don’t mind people having to weave around me, I hate having to weave around other people. Literally up until about 5 minutes before the race I had no idea how fast I was going to run. I had thought about just enjoying myself and coasting to a 3:30-3:40, or trying to bust out a sub 3, since this might be my last fast marathon for a while (more on that later) so I decided to go out sortof fast and just see how my body felt. The course was actually very nice. Hartford is a nice, clean city but they did have a lot of little hills around. We ran along and over the Connecticut River a few times and that was quite beautiful with a cool breeze rolling down. As with most of my races, I brought awesome weather. Rainy and cold the day before and the day after, but race day was perfect. I passed 13.1 mile mark at 1:29:16, and I felt really good. I kept that pace for maybe another 5 miles, then started to get a little tired. Since I knew sub 3 was out of the question (it never really was IN the question) I slowed to a comfortable pace, staying strong until the end. As was pre-planned, about 40 meters before the finish I did something that I had only done once before. I stopped stone cold before the huge finish line crowd and stretched out my arms, then pointing to my shirt, getting the crowd up and excited, then did my handstand. The End. All that was left was the celebration. My #1 fan has been my Mom. Once my Aunt Nancy died a few years back, My mom became the only person on the planet (besides me) to read this blog. She keeps track of my race schedule and always calls me after every race to ask me how it went, how I did, how I feel. To commemorate this historic finish, she made 3 embroidered t-shirts, one each for Misty, Salacia and myself. Mine says “I ran 50 under 40 under 4” and the other two were appropriately labeled. My Mommy is so good to me…. For any people out there close to finishing their 50 state quest, I urge you to finish here at Hartford. This is a huge race, but the race committee are awesome people. The Race Director had VERY nice custom plaques made for the 8 of us who were finishing our 50th state this day. There was even a short ‘awards ceremony’ for all of us at the finish line a little after the 5 hour mark. More hardware will come, as I will soon receive a 50 states marathon club ‘finisher’ certificate, becoming one of <700 people to achieve that goal. I have also now become only the 20th finisher of the 50sub4 group. For that I will receive a plaque and yet another awesome shirt. I now stand amongst some very elite company including my good friend, Gary Krugger, who finished 50 states last year, and just last week became the 4th person to join the more coveted 50sub3 class. I have over 10 sub 3 finishes, but I gave up on speed a long time ago. I will not be joining him there. Now what I hear you say. I have other dreams, other goals (100 lifetime marathons, 100 marathons in 1 state, more 100 milers, etc.) But I know that this one will always be the biggest. It is the one that other people will understand and appreciate most. It is significant. To run a marathon requires time and dedication to training. To run one in all 50 states requires logistics and physical resilience (read: not getting injured). To run every one of them in less than 4 hours requires everything to work, every time, day in and day out. I am certainly not retiring, but I am very much looking forward to the next chapter of my running career. This has been an awesome journey, and I thank all of you who have helped me get through it. I am surrounded by friends and family that have supported me completely through this ordeal and I thank you all so much for being a part of it. I hope I made you proud.